Current turnaround for DarkFrame Hypertuned Mounts is circa 3 weeks from receipt of mount, subject to mount condition and specification (non standard mounts may take longer). Please either pay via the website or when you drop the mount off - please call to book a drop off date - 023 9257 0283. We endeavour to ready your mount within this timescale as the imaging season is now upon us! Book your mount in asap as Summer 2017 slots are filling up! Why tune your EQ5 SynScan Mount? Equatorial mounts by nature are precision made products. However, due to mass production and to keep the prices lower, they are often not adjusted to the best of their ability due to the variances in each mount. Various improvements can be made to transform the performance of your mount from what is a median production build, which may save you the need to upgrade to a more expensive mount if you are happy with the payload you have. Check out how your mount compares in our performance charts. EQ mounts are subject to being outside and often in the damp, so renewing the grease is often a first port of call with a better type more suited to our climate. It will also help reduce friction which means the motors can drive the mount more accurately, both unguided and guided. Also, with more care in adjusting the worm-gears and motor drive train, they can often be made to run smoother and quieter, which also benefits better tracking and periodic error reduction. Mounts do need servicing and can be tuned, like any mechanical device. No-one as yet has designed a maintenance free mount! The EQ5 mount typically runs at ±40-50 arcsecs from new unguided in independent tests and is said to be sweeter than the NEQ6 for astro-imaging. Once tuned our mounts run near-sub-arcsecond Also the mount will run smoother and much quieter once rebuilt. Unguided the mount is running circa ±18 arc-secs or less. We will confirm this as we acquire more data across more mounts. The worm-gear shaft is upgraded with our low-friction Hybrid Ceramic bearings. These reduce the end-float, and provide a very solid feel to the mount, which in turn virtually eliminates the well known rocking motion in both RA/DEC. 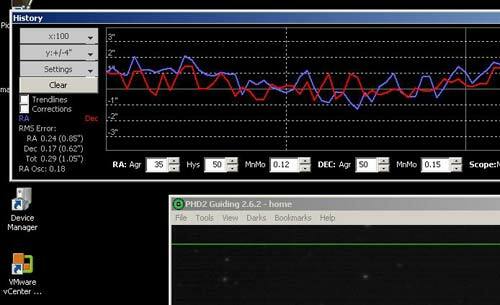 The Build Type we use for the EQ5 is v6.3.3 (Bonneville) which is similar to the AZ EQ6 GT. Once tuned, consistent 300-600sec subs are more than possible with this mount, with very few if any lost frames when guided and 2-4 mins unguided at circa 500mm focal length. Far superior than the standard mount. Here is a customer supplied PHD2 graph of our tuned EQ5. Yes. That's 1.05 Arcseconds. Add an optional Geo-Position Pack or Geo-Guide Pack, which includes as standard a StarGPS and QHYPolemaster to the HEQ5 and your imaging is taken to a whole new level, especially when quided. Mount is reassembled using upgraded greases and oils which operate in all temperatures from -25ºC to +120ºC (we use them in our Export Service and our own products so have been tested at these temperatures for over three years!). Your mount is then readied for shipping/collection. Our three-way UK Courier Service is just £39 fully insured using a tracked service, if you don't have original packaging.